Schools have long played a role in promoting health among students [1–5]. However, schools in many countries now dedicate less curriculum time to health-related programming due to increasing pressures to meet academic performance standards, which place constraints on school schedules [6–8]. One way to maintain health-promoting programmes that is receiving increasing attention is through the integration of health and academic education curricula [9, 10]. To assess our current understanding of these curricula, we carried out a systematic review of such interventions aiming to prevent tobacco, drug or alcohol use (henceforth referred to as ‘substance use’) and/or violence. To our knowledge, this review is the first of its kind. As part of the systematic review, theories of change, process and outcome evaluations were synthesised. Although there are no existing syntheses of process data focused specifically on school-based interventions that integrate health and academic education, those examining the delivery of school-based health promotion interventions more generally can be found in the literature [14–21]. These identify constraining and facilitating factors operating at the school and class level, including the acceptability of the intervention to school staff and the adequacy of support for delivery. However, these factors are inconsistently defined and explored, making synthesis across studies challenging . Theoretical frameworks also offer some suggestions as to what factors are likely to determine successful implementation. For example, May and Finch present normalisation process theory as a framework for understanding the sustainability of intervention implementation, suggesting a number of key factors: intervention coherence (people can make sense of a new practice), cognitive participation (people are willing to participate in a new practice), collective action (people are willing to take on the work required for the new practice) and reflexive monitoring (people are prepared to monitor the practice) . Process evaluations commonly report qualitative, quantitative or mixed results. We anticipated that the quantitative data presented in included studies would address diverse questions and would therefore be too heterogeneous to meta-analyse statistically. Instead, textual reports of quantitative results were subject to thematic synthesis [27–29] after first checking that they were consistent with the quantitative data presented in the study reports. Studies were first read and re-read by two reviewers. The two reviewers then carried out line-by-line coding of process data in NVivo 11, developing inductive codes from these process data. Coding focused on textual reports which included verbatim qualitative data excerpts and author interpretations of these. Summaries of quantitative results were also coded in this manner after first checking that they were consistent with the quantitative data presented in the studies. Support from school managers and other senior staff, including administrators, was cited as a key driver of successful intervention implementation by eight authors (reporting on seven interventions) [30, 34, 32, 35–39], and two sub-themes were identified in the data. Teachers’ perceptions of their teaching environment as one that would be amenable to the intervention increased their own motivation for intervention delivery, with direct impact on implementation. Three sub-themes on this subject emerged from 10 studies of nine interventions [34, 40, 41, 35, 37–39, 42–44]. This sub-theme was raised more than any other (across six different interventions) and related to teachers feeling properly prepared and supported to deliver the curriculum [34, 37–39, 42, 44]. The consistency with which this issue recurred suggests this is essential to successful intervention delivery. This sub-theme was linked to the first theme of supportive schools as, often, much of this feeling of preparedness and confidence in delivery among teachers was instilled through support from management and other senior staff. More practically, the availability of intervention resources such as an easy-to-follow curriculum, adequate training and pre-prepared materials was highlighted as being very useful to teachers. Five studies identified teacher workload and/or burnout as a barrier to intervention implementation [37–39, 42, 43]. This may be partly addressed via school management support as above. The acceptability of the intervention to students was reported as facilitating implementation, particularly where students saw the curriculum’s messages as relevant [31, 33, 40, 43–45]. 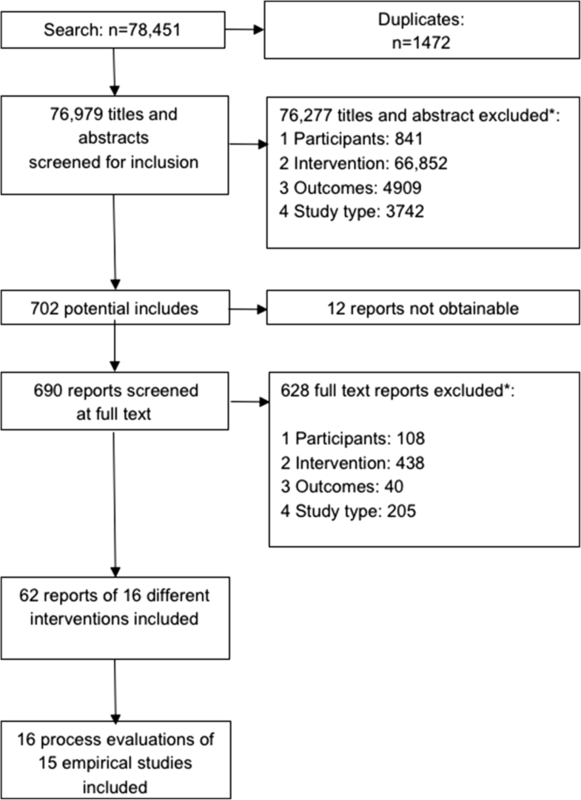 Many interventions in our broader systematic review prioritised reporting on outcomes over process (35 outcome evaluations were included, whereas only 16 relevant process evaluations could be found). This critique can be applied to the reporting of interventions more broadly. A review of implementation data by Michie et al. found that only 5–30% publications of experimental studies had detailed intervention descriptions at all . This lack of detail presents issues when trying to produce replicable interventions. The paucity of intervention description is compounded further by a lack of explanation of the mechanisms by which interventions achieve outcomes and the contextual factors that may influence both implementation and outcomes [22, 48]. This gap has been noted by several authors, and across disciplines [22, 47–51].